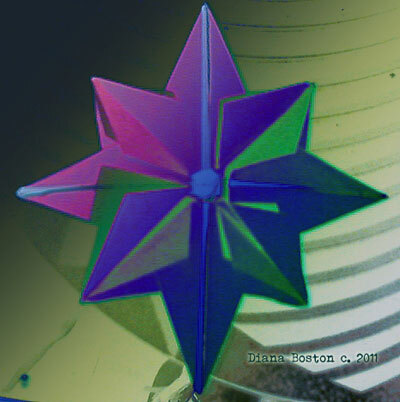 Here are origami 8-pointed star photos that have been submitted by our readers. Check them out! 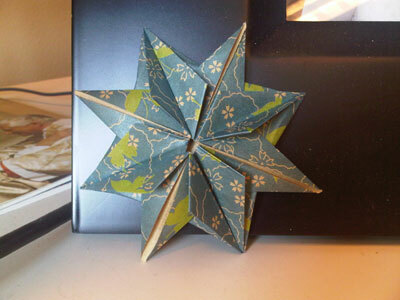 From reader in Bend "Origami 8 pointed star...."
From Viktorija in Kaunas, Lithuania " That's my first attempt of making this origami 8 pointed star. It took a while, but I kinda managed to do it. " 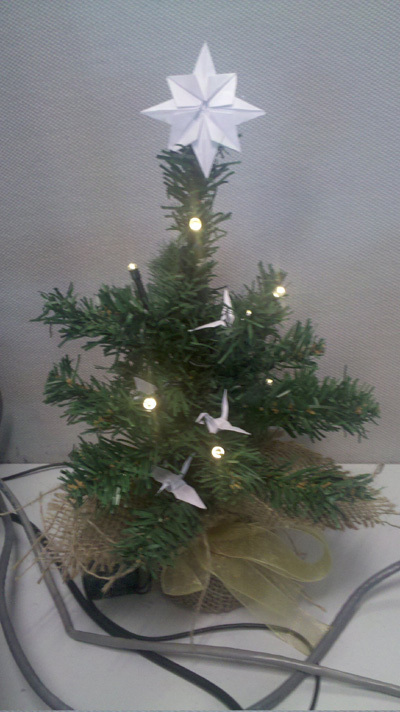 From Bryce in Auckland " I needed decorations for my tree at work, and couldn't be bothered buying any, so I made them! Cranes with an 8-point star on the top. " 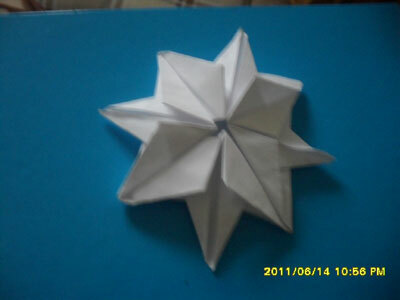 From MJ in Calamba " So easy to make!! " 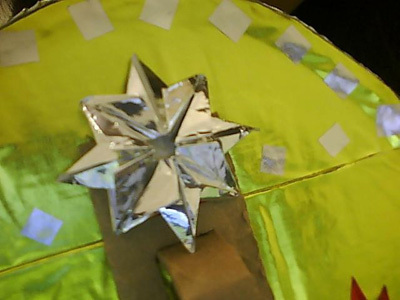 From reader in Singapore " I wrapped my Christmas gift myself. 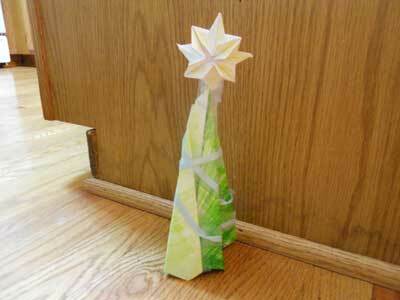 There were a piece of leftover wrapping paper so I made a star and attached it to the gift. " 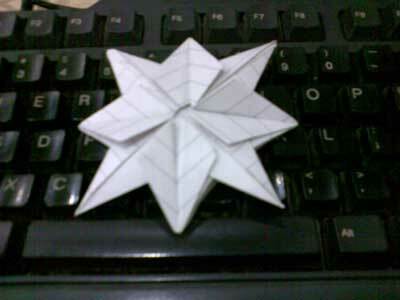 From reader in Bandung "I like the star." 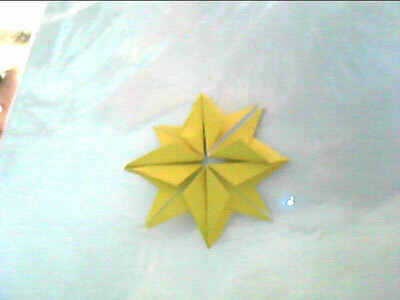 From Safrin in Tanjore " Origami 8 Pointed Star. Thought it'd not be possible, but I'm glad I made it! 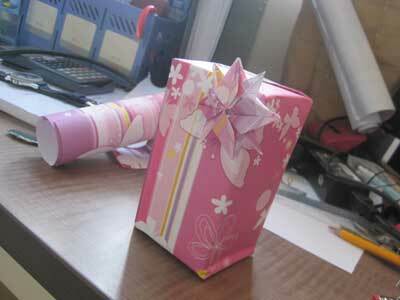 And I've colored it, so it's easier to note the sides and folds. " 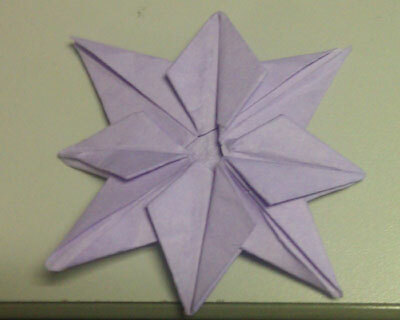 From Marius " this origami star is so simple even though it looked hard! 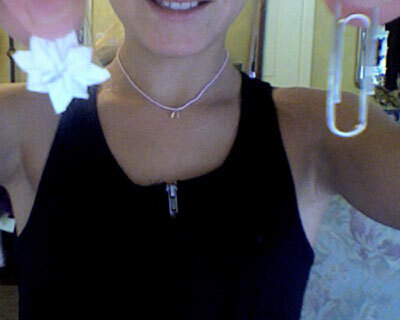 (well to me :S) "
From Amelia in Bloomfield "Tiny!!!!!!!" 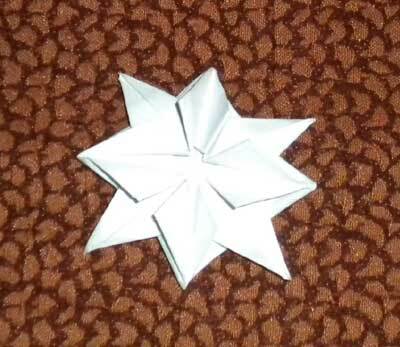 From Libby in Marion " I saw the picture someone submitted of the 8 point Christmas star used as a bow on a present and I decided to make some out of wrapping paper. It was so fun and easy! " From Amelia in Bloomfield "Huge!!!" 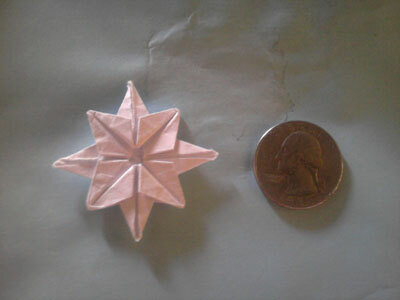 From reader in Homeland " This is my 8 pointed star compared to a quarter. 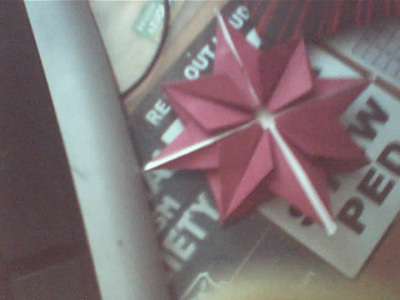 My first 8 pointed star ever!!! 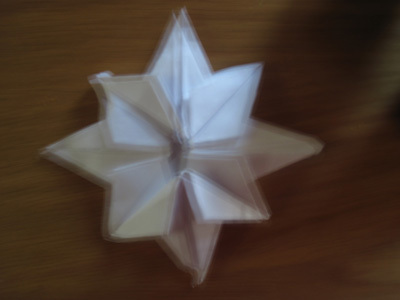 I think I did good." 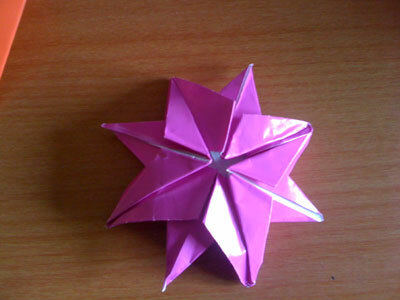 From Diana in Vancouver " Origami star. one sheet. 15cm square. " 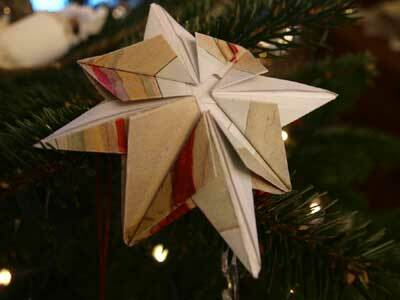 From reader in San Francisco " I added a string and some stickers to make an origami ornament for this holiday. Everyone likes it. 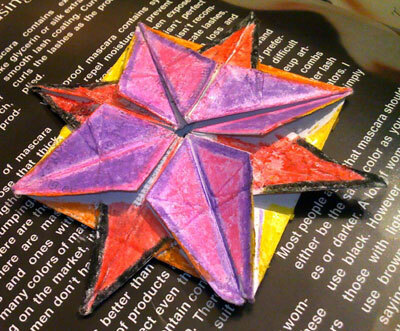 Thanks for sharing your work with us! " 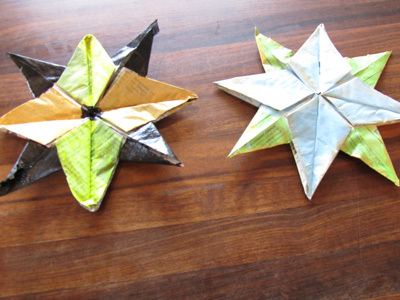 From reader in Winnipeg " Thank you so much for the tutorial. 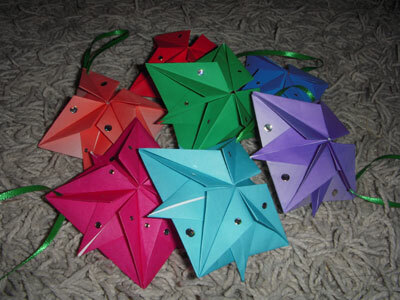 :)I had cranes, lanterns, flower/star (teabag star) and masu boxes as well on my tree. 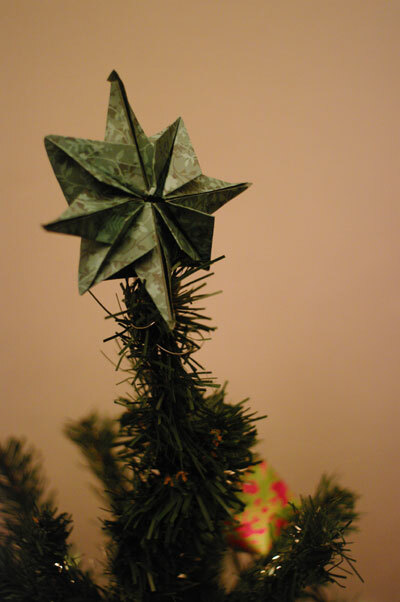 I was able to finally complete my tree. " 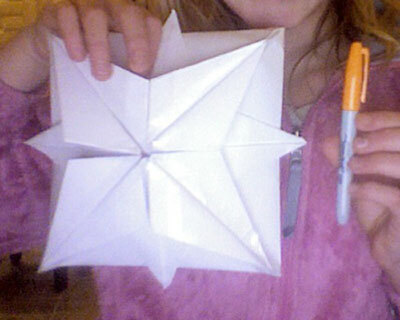 From Chloe in Whiteman Creek "It's so cool!"